How Bite Correction Can Change Your Life? Do you or your child have a problem with their bite or alignment? These problems can seem small at first. However, as a child grows into an adult, bite or alignment issues could cause many health problems. It can even cause speech impediments and difficulty chewing in the future. Find out how bite correction can improve your health and just how important it is to get bite correction via braces if you need it! The structure of your mouth is defined by how your teeth and jaws are formed. Your upper jaw and your lower jaw should both follow the same arch in a U shape. Those arches should also line up together. The teeth as well, should lie on top of one another evenly, with your back top molars resting on your back bottom molars all the way towards the front. 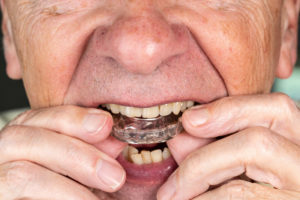 In a normal bite, the front top teeth will rest on top of your bottom teeth, except they will be just slightly in front of those bottom teeth. Orthodontic care is not just for teens that are looking to get a straighter smile. In fact, about 1/4th of all people that wear braces are actually children! The American Association of Orthodontics recommends that children have their first orthodontic visit between the ages of 7 and 8. 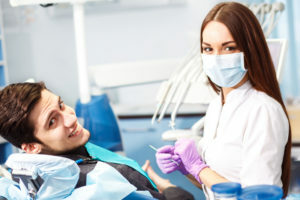 Having an examination early-on helps prevent the progression of orthodontic issues, such as a misaligned bite. How a child’s mouth is forming is a great indication of what their mouth will look like as an adult. If we can already see that their teeth are growing at the wrong angles, or that their jaws don’t line up, we can predict that oral health issues will be present in the future. That is why having this orthodontic appointment at 7 or 8 is so important. Overbite – The upper front teeth overlap too much over the bottom front teeth. Underbite – The upper front teeth rest behind the bottom front teeth. 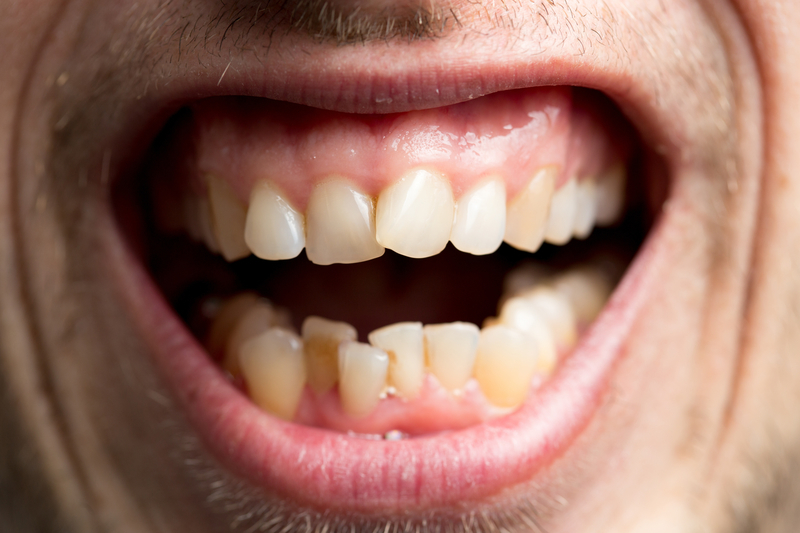 Crossbite – Teeth are at varying angles in the mouth, which can lead to decay, broken teeth and speech problems. The ideal time to receive any treatment for bite correction is during the childhood years. This is when the mouth and jaws are still growing. 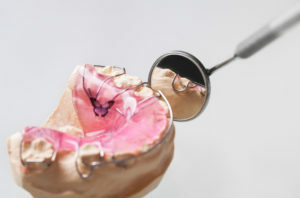 Because the bones aren’t set yet, it is much easier for an orthodontic appliance to mold a bite into the correct shape without too much effort. This is generally why a child would receive bite correction treatment before they are 10 years old. 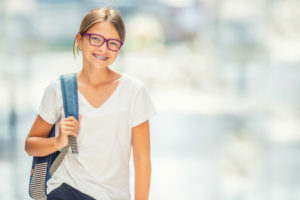 If a child receives bite correction via braces, they benefit from their mouth forming correctly. Where there were once speech problems developing, their speech can start to sound normal without lisps or other impediments. Facial features will appear more normal because the structure of the mouth will be maintained with orthodontic appliances. In a child with severe bite problems, some people can physically see parts of the jaws jutting outward. This makes the face look different than it should, and speech will almost certainly be compromised. We stop that incorrect shaping before the jaws harden later on and before dental diseases and problems are developed. If you didn’t receive orthodontic care as a child, it is not too late to receive it later on in life. Adults and teens make up the other 3/4ths of patients that get braces. At about age 11 or 12, most of the permanent teeth should be in the mouth. At this time, we can look at a patient’s teeth and see if they need their teeth straightened. 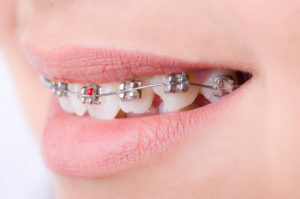 When bite problems are present (because child orthodontics was not done), it is harder to do them as teens and adults, but it can be done with normal orthodontic appliances. In some cases, some surgery may be done to reshape areas of the mouth that have hardened into place. However, the benefits of bite correction and tooth alignment for teens and adults is astounding. Studies show that people perceive you as more successful, healthy and happy if you have straighter teeth than if you have crooked teeth. You’re more likely to get a job over someone that has crooked teeth, because your smile is an expression of your health and how well you care for yourself. That can translate into how well you care for other things, like your obligations. Studies show that in adults and children alike, that confidence soars and smiles are shared more often when people feel good about their smiles. That confidence boost can change your entire outlook on life, and can lead you to be a more successful person than you otherwise could be. 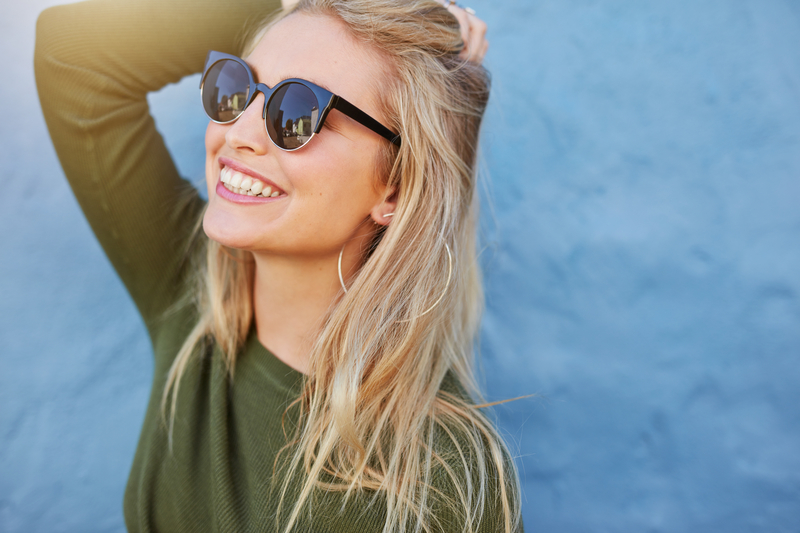 If you have teeth in need of bite correction or straightening, don’t hesitate to see what orthodontic care can do for you! Call Belmar Orthodontics today at (303) 225-9016! Lingual Braces: Straighten Your Teeth Without Anyone Knowing! Lingual braces can achieve the same effect as traditional orthodontics in a manner that is inconspicuous and undetectable. By discreetly attaching the braces to the back of the teeth instead of the front, Dr. T.C. Hardy can help you achieve straight, healthy and beautiful-looking teeth. Consider the benefits of lingual braces when you are deciding which orthodontic appliance you want! No matter what braces option you are going to get, we always meet with patients to first have an orthodontic consultation. At this consultation, Dr. Hardy will examine your teeth, checking their straightness as well as your bite and alignment. The size of your teeth matter if you request to have lingual braces put on your teeth. Dr. Hardy will examine the backs of your teeth to determine if you are a candidate to receive them and if brackets and wires will comfortably fit on the tongue-side of your mouth. Once Dr. Hardy has determined that you are an ideal candidate for lingual braces, he will take impressions of your teeth that are then sent to a lab for custom-made brackets and wires. At your next appointment, we will gently bond the metal to the back of your teeth with the attached brackets. We will then run a metal wire through the brackets. The process is quite similar to what is done with patients who choose traditional metal braces on the front of their teeth. However, instead of your cheeks adjusting to the feel of the brackets, your tongue will be the part adjusting to the new appliance. At each appointment, Dr. Hardy will examine your teeth and adjust the wires as needed to straighten your teeth properly. You can achieve the same results as traditional braces, only with a hidden treatment apparatus on the tongue-side of your teeth. These braces have to be custom-made to the back of your teeth, because teeth size can vary from patient to patient. Children are not usually candidates for lingual braces. It all depends on their age and the size of their teeth. Baby teeth are small and with many patients, there is not room to fit brackets and wires on the back of the teeth. Children who have larger teeth may be candidates. Adults use these braces much more often than teens and children for both reasons of teeth-size and professional/social aspects. Patients who play wind instruments will have an easier time playing if they have lingual instead of traditional metal braces. A dentist must take continuing education courses and receive additional training in order to provide lingual orthodontic options to patients. This means that not all dentists give patients this option like Dr. Hardy does. 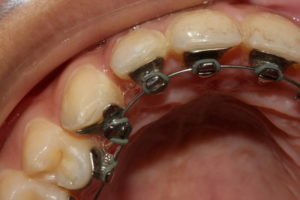 Brackets placed on the back of the teeth are ones that others will not be able to see. You can go throughout your entire orthodontic process without others knowing that you have braces. However, others will notice your teeth becoming straighter over time. 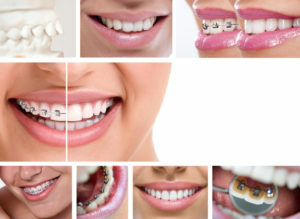 Because lingual braces are made of metal brackets and wires (just like traditional braces), they are able to correct bite and alignment issues. Other braces options like Invisalign, are not able to do that. You may want to invest in a waterpik for your teeth. Lingual braces have brackets, so food can get stuck in them, which is why you would want a waterpik to get the food out. Patients can care for their lingual braces the same as they would traditional metal braces. In the past, there weren’t many options when it came to straightening your teeth. Many cultures simply tried cruel methods of pushing and forming the teeth until metal braces were created. Over several decades, metal braces were changed and adapted to how people lived. In modern times, people are ever busy and on-the-go. Aesthetics plays a huge role in how people view themselves and how others view them. This is why hidden orthodontics were created. Traditional Metal Braces: These are almost the same as lingual braces, except they are made of silver metal alloys instead of gold ones. The brackets and wires go on the front of the teeth, where they are noticeable to others. Ceramic Braces: Similar to metal braces, this orthodontic appliance also rests on the front of your teeth. They are made of white, ceramic material, helping them to blend in more with the teeth. However, they are still somewhat noticeable. Invisalign Treatment: This orthodontic option involves no brackets and wires bonded to your teeth. You receive a set of transparent aligners custom-made for your teeth each week, that you wear for 20-22 hours of every day. However, although this option makes oral hygiene easier, they cannot help many bite and alignment issues. That is why patients opt for a discreet lingual option that can correct those issues. At Belmar Orthodontics, we know that getting braces is a big deal for teens, adults, and even children. Patients worry about their appearance often, which is why options such as Invisalign and lingual braces were invented in the first place. We are excited to be able to offer adults and teenagers an alternative to traditional metal braces with hidden lingual braces! If you want to know more about these braces or want to schedule your consultation, call Belmar Orthodontics today at (303) 225-9016! At Belmar Orthodontics, our success is depends on your success. Part of achieving that success is having a beautiful smile. Studies show that a straighter, more beautiful smile can help you to become more successful and be perceived as such by others. A more beautiful smile can help your self-esteem, your social standing, and can open opportunities to you that you otherwise would not have had. However, a great smile is something that takes dedication and special care throughout your life. We can help you know how to care for your smile to keep it dazzling. We can also provide you state-of-the-art treatment and services that can provide you a beautiful smile as well as patient education for keeping that smile healthy for life. Learn more about how a more beautiful smile can benefit you and how you can achieve it! To have a beautiful smile, you have to take special care of your teeth. You do this through proper oral health hygiene practices, which includes brushing and flossing your teeth every single day. The American Dental Association recommends brushing your teeth at least twice a day and flossing at least once a day. Notice how we said “at least”. This means that you can brush and floss your teeth even more than those recommended amount of times each day. In fact, brushing and flossing after every meal can significantly reduce your risk for tooth decay and gum disease. We also said you must practice this routine “every day”. This is the part that takes work. To keep your body healthy, you must have solid, healthy habits that take up a part of your every day. To keep a healthy body you must take time to eat right and to exercise. In order to have healthy eyes, you need to visit your eye doctor. To keep your teeth healthy, you have to take time to clean them as well as visit your dentist. How often? We recommend going to the dentist at least twice a year, if not more. For your orthodontic work, you will come into the office every 4-6 weeks. These appointments are very important to determine if your bite and alignment is healthy and in correct position. It is also very important to ensure you don’t have tooth decay forming, as braces are more prone to causing cavities because the teeth are harder to clean with brackets. A healthy smile takes work, but it is well worth the benefits your reap. Not only are healthy smiles great for you, but they are also more beautiful not only for you, but for others. A beautiful smile can impact the level of self-esteem you have as well as confidence. In fact, studies show that those who have a straighter, more beautiful smile tend to be more confident. They also are perceived as more confident and successful by their peers. For example, Invisalign conducted a study about the importance of straightening teeth and what it did for those who did it. For adults, a straighter smile made them appear more successful to others. In many cases, it also helped them be more confident so that they actually were more successful. Between studying people with straight smiles versus those with crooked smiles, the ones with straight smiles were perceived as smarter and in 75% of cases, more trustworthy. People also perceived them as having more dates and as more attractive. Those with a straighter, more beautiful smile were also more likely to get a job (almost twice as likely as someone with a crooked smile). Studies conclude that a more beautiful smile works wonders for you in every aspect of your life! Having straighter teeth and a beautiful smile is not only important for adults, but it makes an impact on a child’s life as well. In studies, children that had better smiles had a boost of confidence that helped them be more confident in their studies and with others. Teenagers also have this boost of confidence. In modern times, child orthodontics is becoming much more popular. Child orthodontics seeks to correct orthodontic issues present in childhood that would become much more severe later on in life. We recommend that children see the orthodontist between ages 7 and 8. This is a time when bite and alignment issues manifest and when they can most easily be corrected. A child’s jaw is still forming and many of the baby teeth are falling out to make room for the adult teeth. With child orthodontics, we can correct bite and alignment so it is even. We can also monitor how the permanent teeth are coming into the mouth. This time period is one where many pre-teens have their teeth grow in. We need to make sure those teeth come in straight so that those teens can enjoy a beautiful smile that is straight, and that it is one they can carry with them throughout adulthood. Orthodontics can work wonders for the confidence, self-esteem and oral health of children, teens and adults alike. Some patients will only need treatment for a short time while others will need straightening treatment for 18-24 months. This investment is well worth your time for what a beautiful smile does for you personally and socially. If you would like to learn more about your orthodontic options and schedule your consultation today, call Belmar Orthodontics at (303) 225-9016!